That is where I found the definition for “amuse-bouche”. Those of you who watch the Food Network may already know, but according to A.Word.A.Day it is, “Similar to but not to be confused with hors d’oeuvre. This is a tidbit, often tiny, served as a free extra to keep you happy while you are waiting for your first course to come. It gives you an idea of the chef’s approach to cooking and the restaurant’s attention to your appetite”. Last night I prepared and served my first amuse-bouche and it did indeed give my two guests an idea about my approach to cooking! Inspired by the ‘Flower Spoon” served at Reford Gardens, I created my own version. 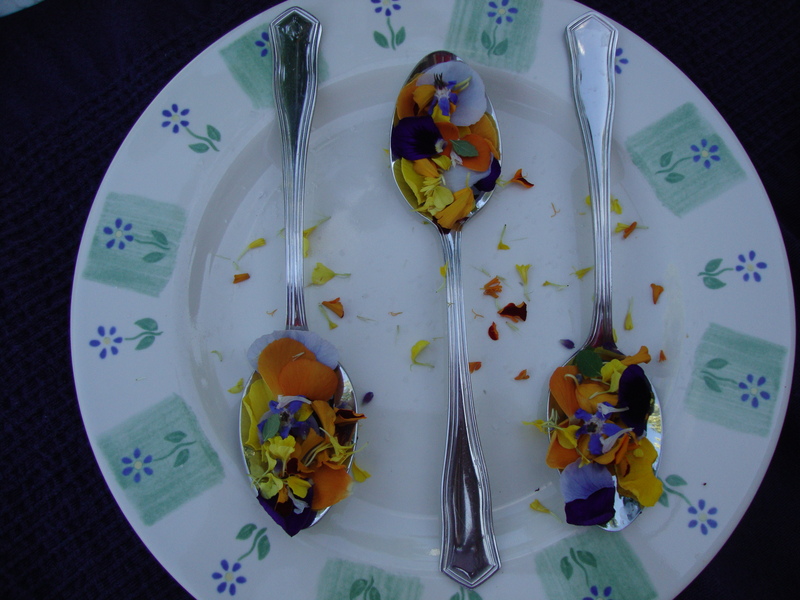 There were marigolds, lavender, lemon balm flowers, and three colours of pansies served with Reford’s Strawberry Basil preserve garnished with course sea salt. It was one simple mouthful, sweet and salty, flowery and pretty. I was so pleased to have company and an excuse to bring my garden into the kitchen. 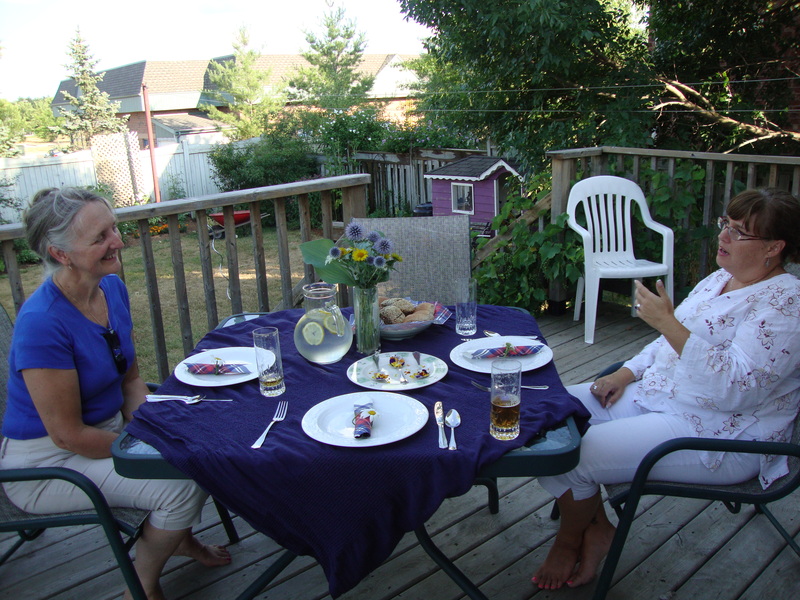 Two clergywomen friends, S. and S. came for the evening in what is becoming somewhat of a regular gathering. We eat good food and talk for hours about everything from camping to clergy fashion. We tend to laugh alot, and there is always lots of wine to go around, too. This time, I was sharing a little of my sabbitical with them both through what I said and through what I served. After the amuse-bouche, I brought out a roasted beet and endive salad. The golden beets were from the garden, although I had to buy the endive–I have not yet been so adventureous as to grow it myself. It was tossed with an herb viniagrette with chives, parsley, tarragon and the first (very potent!) garlic from my garden. 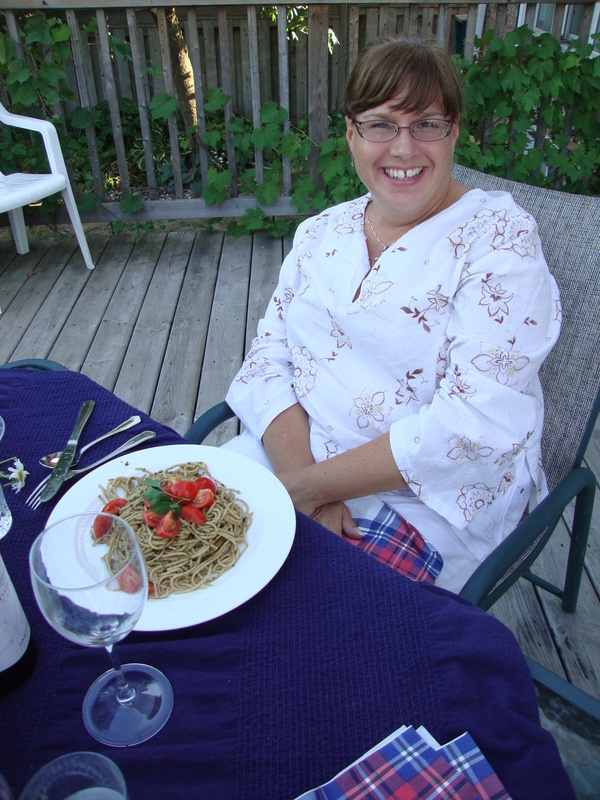 The main course was simple: whole wheat pasta tossed with fresh basil pesto, with garden tomatoes and a sprig of parsley. It felt so decadent going out to the garden and coming in with a huge bundle of basil. It was also good for my basil–in this hot summer weather it needs to be sheared off to keep it from blooming. To finish off, S. brought and prepared juicey Niagara peaches. They were served over creamy yogurt cheese and drizzled with fresh honey. Of course it was garnished with fresh mint from the garden, and served in martini glasses it looked very pretty. It was a lovely, light finish to the meal. We talked and talked over our food, and my friends stayed until long after the sun went down. When we finally moved inside to avoid the mosquitos, we nibbled on dark chocolate flecked with hot chilies. We decided that our culture has trouble appreciating Hebrew Bible stories and often misses the humour in them. We lamented the many church closings that we see ahead in every denomination. We traded vacation stories (did you know there is such a thing as a stamp collecting conference?) and talked about funerals, diamonds and clergy housing. We didn’t solve all of the world’s problems, but we did find warm and genuine community. The evening left me–and I hope both of my friends–feeling connected and understood. It is good to take the time to get together with people who understand your life, to encourage each other and to share good food. This is nourishment that all of us need, for our bodies and for our souls. 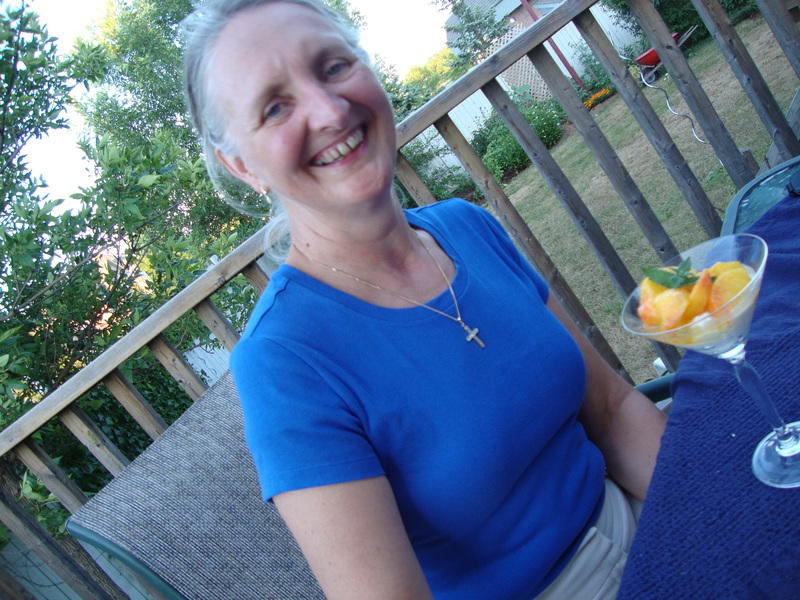 This entry was posted in Uncategorized and tagged church, food, friends, herbs, Reford Gardens. Bookmark the permalink. It sounds like you had a pleasant meal fresh from your garden. Yes, it is always so nice to eat straight out of the garden. Thanks for sharing the meal! I’ve never eaten flowers before. I didn’t even know marigolds were edible! How do they taste exactly? You’ll have to try them. Marigolds have sort of a mild, peppery taste, but not as peppery as nastursium blooms–those are much stronger. Like pansies, if marigold petals are sprinkled over a salad they give colour but not too much flavour. Roses are nice although I don’t really grow any. I have heard that daylily flowers are edible, too, although I haven’t figured out how to incorporate them into a meal yet. With all of them, just take the petals off of the main stem unless you are using the whole bloom as a garnish. You’ll have to tell me what you think when you try some! Hmmm….I have tons of marigolds. I just might try this! Here’s another dumb question – how did you wash them before eating? When we were first married, I would hear M. use a word each morning that seemed not quite in his usual vocabulary – and then I would hear it again and then again – “Use it three times and it is yours” was the explanation – its good to learn new words! I think of Ottawa restaurants, when I hear amuse-bouche – many of them like to tease our palettes as we wait for our delicious meals! According to a friend, the chef at one of the restaurants spends a lot of time dreaming of the next day’s amuse-bouche and trying new ideas – what a great job! . I like the idea of using a word three times–what a great discipline. I’m glad to hear about your Ottawa amuse-bouche experience. I agree–what a fantastic job it would be, dreaming those up.